We're all trying to cut a few corners these days and conserving all the scraps just makes sense. 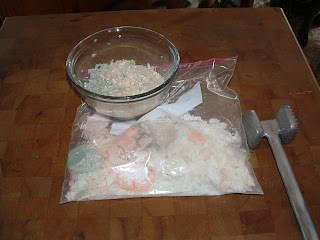 Save up your old bars of soap, making sure they are dry slivers. 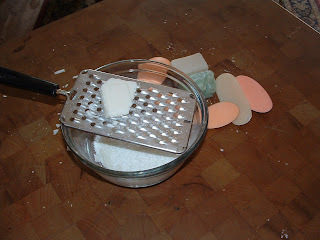 Use your grater or chopper to make small pieces. Or like me I eventually give up and use an old ziploc and a meat tenderizer. 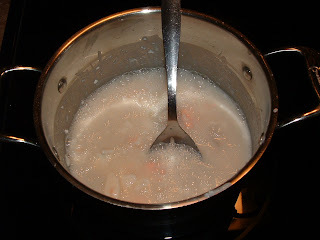 Put them in a sauce pan with 8 ounces of water for every 1 1/2 cups grated slivers and bring to a boil, stirring constantly. They should blend together like a smooth pudding. 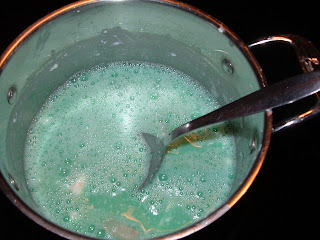 I added a hint of lemon extract and green food color also. Pour into molds. 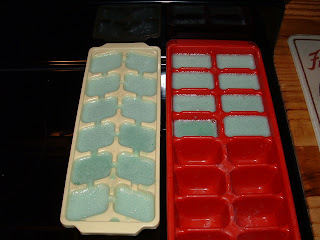 I like to use an old ice cube tray for a smaller decorative soap for the guest bathroom or this should make about 3-4 medium-sized bars. After they are set up, pop the bars out of the molds. If they don't come out easily, stick them in the freezer for 4 hours or overnight, or until they feel dry when you touch them. Then they will pop out easily. Air dry them without their touching each other for 2-3 days.